With valuations at top-of-the-cycle highs, it’s a tough time to do deals in the multi-residential space. A couple of savvy “trades”, however, gave True North Apartment REIT (TN.UN-T) the financial wherewithal to acquire adjacent apartment buildings in Hamilton for $25.4 million. The Toronto-based REIT this week finalized the acquisition of the buildings, 150 and 160 Market Street, as well as the divestitures that partially funded the purchases. In two separate transactions, the REIT sold 380 Gibb Street in Oshawa (for approximately $19.3 million) and a smaller building at 2292 Weston Rd., Toronto (for $10.2 million). The new buildings give the REIT a total of 278 residential suites that have recently undergone significant balcony and lobby upgrades (150 Market St. shown in image). The price represents a combined capitalization rate of 5.2 per cent, and comprises $12.1 million in cash, the issuance of 460,978 class-B limited partnership units of subsidiaries of the REIT which can be exchanged for REIT’s trust units and the balance in new mortgage financing (five years at approximately 2.1 per cent). The REIT, which previously had one property in the Hamilton market, covets the blue-collar city for its strong fundamentals: vacancy rates are the lowest in a decade and rental rate growth has topped the Ontario average over the past three years. The REIT is also pleased with the prices it secured for its Toronto and Oshawa properties, which is the fruit of a suite renovation program. The “trade” of two GTA buildings for two others also maintains its presence in the region. “What we have done is traded out of two assets where we achieved some upside into two assets where we think we have an opportunity now to reposition and move the rents and create additional value there,” Veiner said. As well, the sales free up some additional cash which the REIT can utilize for various purposes, chief among them a normal course issuer bid for its undervalued units. REIT management would like to add to its GTA portfolio, in which it currently owns and operates eight properties, but is wary of high valuations in the region. “The GTA market is particularly strong, it is very hard, given our cost of capital, it is very hard to find accretive acquisitions in the GTA. The market is tight, there is some new supply coming on, but is still very limited and it doesn’t keep up with the pace of the net migration coming into the GTA. “So we are still seeing valuations at all-time highs in the GTA,” he added. The REIT president has not ruled out acquisitions. “We are always looking” but sees the low-interest rate environment putting a floor under high valuations. 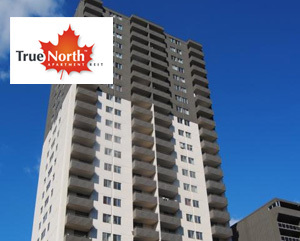 True North Apartment REIT currently owns 8,908 units in 83 properties in Nova Scotia, New Brunswick, Quebec, Ontario and Alberta. Its biggest presence is in Ontario where it has more than one half of its properties. True North Apartment traces its history to 2012 when it was founded by long-time multi-residential owner and operator Daniel Drimmer. The REIT is part of Drimmer’s Starlight Investments Ltd. empire, a Toronto-based real estate investment and asset management company with more than $4.5 billion of assets under management. Besides True North Apartment REIT, it also controls the True North Commercial REIT (TNT.UN-T) and has many other ventures.